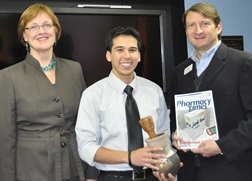 Butler PharmD candidate Andrew Gonzales ’14 is one of only eight pharmacy students from across the nation to receive the 2013 RESPy (Respect, Excellence, and Service in Pharmacy) Award. Andrew Gonzales, center, receives his RESPy Award from Wal-Mart representative Wayne Mitchell. College of Pharmacy and Health Sciences Dean Mary Graham is at left. Sponsored by Pharmacy Times and Wal-Mart, the award recognizes pharmacy students who have made a difference in their communities by demonstrating excellence in pharmaceutical care and advancing the profession of pharmacy. Gonzales was selected on the merits of his significant volunteer service to the Butler University Community Outreach Pharmacy (BUCOP), a multidisciplinary, student-run free clinic serving patients on the east side of Indianapolis. He told the magazine that he first became involved with BUCOP to fill his required volunteer hours, but, after his day volunteering at the clinic, he knew he wanted to dedicate more time to the organization. “It was a place where I could really establish my counseling skills and therapeutic knowledge, help improve the lives of others, and eventually develop leadership skills,” he said. After spending more time in the clinic than any other previous student during the summer before his P2 year, Gonzales became clinic chair. In this role, he helped to facilitate the opening of a second student-led clinic, located on the west side of Indianapolis. Gonzales has also served as a student liaison for the Indiana Academy of Community Pharmacists. He is also actively involved with the pharmacy fraternity Phi Delta Chi, helping to raise money for St. Jude’s Children’s Hospital and to organize social events to bring students closer together. Read Gonzales’ full interview at http://www.pharmacytimes.com/publications/issue/2013/October2013/Seizing-Opportunities-to-Become-a-Better-Pharmacist#sthash.pkM0qro0.dpuf.